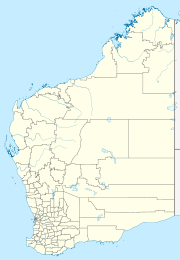 Koorabye is an Aboriginal community in the Kimberley Region of Western Australia, within the Shire of Wyndham-East Kimberley. Koorabye is located approximately 100 km south west of Fitzroy Crossing. Development at the community began in 1992 however secure land title to the site has not yet been received. The community is accessed from an unsealed road that extends approximately 95 km from the Great Northern Highway, passing through Yungngora community. The community has an approximate population of 50 people. The community consists of 14 houses, located around a central open space area. The community also contains a women's centre, single men's quarters and a primary school. The community is covered by the SDWK Nyikina Mangala Indigenous Land Use Agreement (WI2005/001). Members of the community have cultural affiliations with the Walmatjarri people of the Great Sandy Desert. Koorabye does not have its own registered community corporation. The community is managed more broadly by the Marra Worra Worra Aboriginal Corporation, who provide CDEP and other services to the community. Koorabye Layout Plan No.2 was prepared in accordance with State Planning Policy 3.2 Aboriginal Settlements. It was endorsed by the community and the WAPC in 2007. The layout plan map set and background report can be viewed at Planning Western Australia official site. This page was last edited on 11 June 2017, at 16:34 (UTC).